Written at Craiglockhart in the first half of October 1917, and revised at Scarborough or possibly Ripon in January-March 1918. This draft includes markings and revisions by Sassoon. This is no. 144 in ed. 'The Complete Poems and Fragments'. 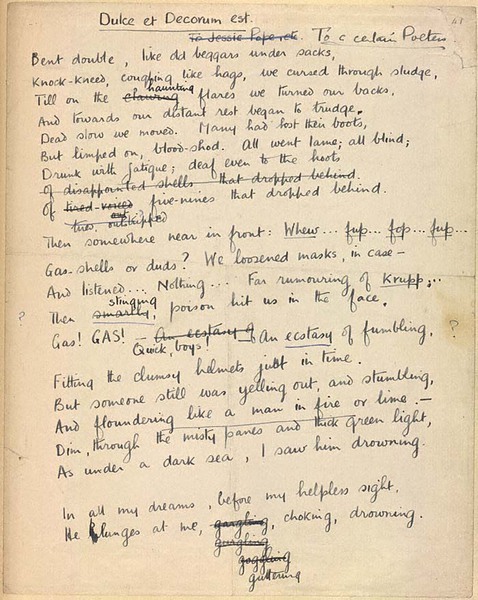 “Dulce et Decorum Est,” First World War Poetry Digital Archive, accessed April 22, 2019, http://ww1lit.nsms.ox.ac.uk/ww1lit/items/show/8175. Written at Craiglockhart in the first half of October 1917, and revised at Scarborough or possibly Ripon in January-March 1918. This is no. 144 in ed. 'The Complete Poems and Fragments'.